Production: Twentieth Century-Fox; black and white, 35mm; running time: 97 minutes. Released November 1946. Filmed on location in Monument Valley, Utah and in New Mexico. Producer: Samuel G. Engel; screenplay: Samuel G. Engel and Winston Miller based on a story by Sam Hellman, from the novel Wyatt Earp, Frontier Marshal by Stuart N. Lake; photography: Joseph P. MacDonald; editor: Dorothy Spencer; art directors: James Basevi and Lyle R. Wheeler; music: Cyril Mockridge and David Buttolph; orchestrator: Edward B. Powell; special effects: Fred Sersen; costume designer: Rene Hubert. Cast: Henry Fonda ( Wyatt Earp ); Linda Darnell ( Chihuahua ); Victor Mature ( Doc John Holliday ); Walter Brennan ( Old Man Clanton ); Tim Holt ( Virgil Earp ); Ward Bond ( Morgan Earp ); Cathy Downs ( Clementine Carter ); Alan Mowbry ( Granville Thorndyke ); John Ireland ( Billy Clanton ); Grant Withers ( Ike Clanton ); Roy Roberts ( Mayor ); Jane Darwell ( Kate Nelson ); Russell Simpson ( John Simpson ); Francis Ford ( Dad, old soldier ); J. Farrell McDonald ( Mac the barman ); Don Garner ( James Earp ); Ben Hall ( Barber ); Arthur Walsh ( Hotel clerk ); Jack Pennick ( Coach driver ); Louis Mercier ( Francois ); Micky Simpson ( Sam Clanton ); Fred Libby ( Phin Clanton ); Harry Woods ( Luke ); Charles Stevens ( Indian Joe ); Danny Borzage ( Accordian player ); Mae Marsh. New Jersey, 1984; also in Avant-Scène Cinéma (Paris), February 1985. Everson, William K., and George N. Fenin, The Westerns: From Silents to Cinerama , New York, 1962. Haudiquet, Philippe, John Ford , Paris, 1964. Springer, John, The Fondas: The Films and Careers of Henry, Jane and Peter Fonda , New York, 1970. Kitses, Jim, Horizons West , Bloomington, Indiana, 1970. Place, Janey, The Western Films of John Ford , Secaucus, New Jersey, 1973. McBride, Joseph, and Michael Wilmington, John Ford , New York and London, 1975. Sinclair, Andrew, John Ford , London and New York 1979. Anderson, Lindsay, About John Ford , London, 1981; New York 1983. Schatz, Thomas, Hollywood Genres: Formulas, Filmmaking, and the Studio System , New York 1981. Lourdeaux, Lee, Italian & Irish Filmmakers in America: Ford, Capra, Coppola and Scorsese , Springfield, 1990; 1993. Darby, William, John Ford's Westerns: A Thematic Analysis, with a Filmography , Jefferson, 1996. Variety (New York), 9 October 1946. New York Times , 4 December 1946. New Yorker , 14 December 1946. Auriol, Jean-Georges, "Lettre à John Ford sur My Darling Clementine ," in Revue du Cinéma (Paris), Spring 1947. Rieuperout, Jean-Louis, in Quarterly of Film, Radio and Television (Berkeley), Winter 1952. Springer, Henry, "Henry Fonda," in Films in Review (New York), November 1960. Cowie, Peter, "Fonda," in Films and Filming (London), April 1962. Fonda, Henry, "Fonda on Fonda," in Films and Filming (London), February 1963. Brode, Henry, in Cineaste (New York), Fall 1968. Wood, Robin, in Film Comment (New York), Fall 1971. "Ford Issue" of Filmkritik (Munich), January 1972. Buffa, M., and C. Scarrone, "Per una rilettura del cinema classico americano," in Filmcritica (Rome), October-December 1973. Gomery, Douglas, "Mise-en-Scène in John Ford's My Darling Clementine ," in Wide Angle (Athens, Ohio), vol. 2, no. 4, 1978. Marinero, P., in Casablanca (Madrid), January 1983. Darby, W., "Musical Links in Young Mr. Lincoln, My Darling Clementine , and The Man Who Shot Liberty Valance ," in Cinema Journal (Austin, Texas), no. 1, 1991. 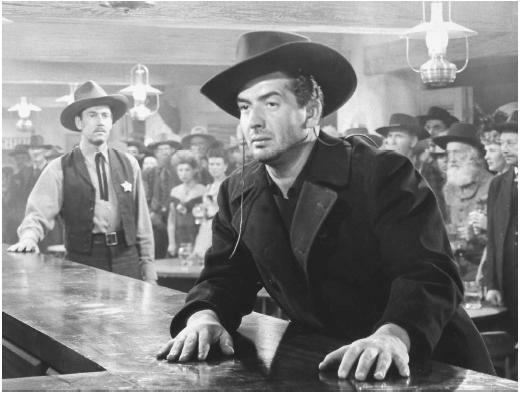 Nielsen, R., "Ray's Way: John Ireland in My Darling Clementine ," in Classic Images (Muscatine), no. 191, May 1991. Erisman, F., "The Night Christopher Lloyd Danced with Mary Steenburgen," in Jounal of Popular Film and Television , vol. 22, no. 1, Spring 1992. Luhr, W., "Reception, Representation, and the OK Corral," in Florida State University Conference on Literature and Film , vol. 18, 1993. Kermode, Mark, "Video: My Darling Clementine Directed by John Ford," in Sight and Sound (London), vol. 4, no. 5, May 1994. Combs, Richard, "The First Cut is Still the Bleakest: The Wild Bunch Directed by Sam Peckinpah/ My Darling Clementine Directed by John Ford," in Times Literary Supplement (London), no. 4832, 10 November 1995. Romney, Jonathan, "America's Creation Myth: My Darling Clementine Directed by John Ford," in New Statesman & Society (London), vol. 8, no. 381, 1 December 1995. Simmon, Scott, "Concerning the Weary Legs of Wyatt Earp : The Classic Western According to Shakespeare," in Literature/Film Quarterly (Salisbury), vol. 24, no. 2, 1996. Yawn, M., and B. Beatty, "John Ford's Vision of the Closing West: From Optimism to Cynicism," in Film and History (Cleveland), vol. 26, no. 1/4, 1996. Schwengler, O., "Exercices de style a 'OK Corral,"' in Cinémaction (Conde-sur-Noireau, France), vol. 86, no. 1, 1998. My Darling Clementine is considered the archetype of the classic western. In retelling the familiar story of the Earp brothers standing up to the evil Clanton family, director John Ford proved Hollywood genre films would become great cultural artefacts. However, Ford, one of the industry's most honored directors, is usually better remembered for other masterworks. While My Darling Clementine is considered one of his better films, it is only one of many in a truly remarkable career. Ford, however, did not want to direct this classic work originally. After World War II Ford, like many of Hollywood's highly rated directors, formed an independent company, in this case Argosy Pictures. But he still owed Twentieth Century-Fox one more film. (Fox's production chief Darryl F. Zanuck tried to tempt Ford to renegotiate his Fox contract for a guaranteed $600,000 per year plus limited freedom but Ford refused.) Zanuck assigned Ford to My Darling Clementine starring Fox stars Henry Fonda and Victor Mature. Shooting began in Monument Valley in May, 1946, and was completed within 45 days. Zanuck found Ford's version too long, and the story unclear, so he cut 30 minutes, and re-structured some of the remaining material. Released in November, 1946 the film received favorable reviews, and earned respectable, but not record-breaking revenues. The structure of My Darling Clementine is straightforward, and symmetrical, opening with the ominous meeting of the Earps with the Clantons, and closing with the gun-fight at the OK Corral (and Wyatt's half-hearted promise to return). All this seems to take place in three or four days. Although the events are grounded in history (Ford claimed to have gotten this version directly from friend Wyatt Earp), the details were transformed to make a popular film. The Doc Holliday figure was transfigured the most. Like central characters in The Searchers and The Man Who Shot Liberty Valance , Holliday tragically stands between primitivism and civilization. Unlike the Earps, this character fails to find a way to reconcile his place in the changing world, and turns to alcohol and a desire for death. Disintegration of the family was a dominant theme in Ford's work prior to World War II. In My Darling Clementine the contrast between the Earps and Clantons is clearly drawn, with death at the ultimate shootout predestined. The Earps are diametrically opposed to the Clantons, yet strong similarities exist. In both cases, the father holds powerful authority. "Old Man" Clanton beats his sons with a whip, bullying them like animals. The Earps, however, are more civilized, and continually appeal to their unseen father ("How will we tell Pa?"). In the end Wyatt and Morgan, the surviving brothers choose to return to tell Pa of recent events rather than remain to help civilize Tombstone. My Darling Clementine seems to present a well known story, set in the familiar context of the western. Upon closer examination of the film, however, one can still see the confusion Zanuck must have sensed, such as the sequence in which the Earps come to town. Wyatt settles down for a shave when gunshots arouse him. He goes through the hotel (next to the barber shop) and emerges, in a medium long shot, alone on the sidewalk. A barber pole serves as a reference to locate him in the darkness. Wyatt goes across the street to the source of the trouble. We see him with the Oriental Saloon in the background, its doors clearly seen in deep space. Wyatt enters the Oriental saloon to capture Indian Joe, the perpetrator of the trouble. Wyatt then gathers the barber from the crowd of spectators and seeks a continuation of his shave. Later in the film we learn, through several long establishing shots, that there is no Oriental saloon on the other side of the street. This absence of the continual "referential focus" disrupts the film's visual rhythm, setting this sequence apart from the rest of the film. There are numerous other examples of visual discontinuity in this film, all violating rules of classical Hollywood style. Indeed in this seemingly simple work Ford develops a complex visual pattern of stability and disruption in the world of Tombstone. Ford seems to be foreshadowing his autocritiques of the western genre made throughout the 1950s and 1960s. In its use of generic elements My Darling Clementine suggests the western myth might not be as stable as it was prior to World War II. Although in the end the film seems to promise the formation of a utopian community, the western hero does not seem to be able to reconcile his individual and social roles. He rides off in the closing sequence with only a vague suggestion he will return to Clementine and the community. To further play on the hero's ambiguous character Ford continually reminds us that he does not fit in. My Darling Clementine 's most cited sequence is not its elaborate gunfight, but rather a dance in which Wyatt Earp displays his lack of grace on the dance floor. This Eastern ritual is here to stay, whether the western hero fits in or not. Ford seems to have been influenced in My Darling Clementine by his recent military experience during World War II. Despite the fact Ford made seven films about the United States Cavalry, My Darling Clementine seems to be his most militarist western, both in theme and action. The Earps represent a new type of law—cold and calculating. They operate within the law, yet are always clearly able to kill in a most efficient manner. Family ties and a sense of justice seem all that is necessary to justify action. Civilization defends itself only by obliterating the other side, and then leaving when the job is done, much as the popular image of the role of the American military during World War II. In the end, in structure, theme and style Ford seems to be undercutting the anarchic spirit of the western, so celebrated in 1939 with his Stagecoach . The style seems classical but upon closer inspection is not. The themes seem classical, but contradictions and loose ends abound. Even closure, the Hollywood system's point of "wrapping the package," is confused and ambiguous. My Darling Clementine represents the work of a filmmaker ready to break out of the studio system and go onto more complex projects, as Ford would. In an uneven path he would make his way to his masterworks, westerns of complexity and ambiguity: The Searchers (1956) and The Man Who Shot Liberty Valance (1962). My Darling Clementine , a masterwork in its own right, foreshadows Ford's greatest films.